Safety Notice – Important – Read This! When entering grain tanks, bins, and silos, follow these tips from the Kansas Grain and Feed Association’s Safety, Health and Environment Committee. DO have a written entry permit completed by the supervisor. DON’T discard entry permits until after entry operations have been completed. DO isolate all hazards of a mechanical, electrical, hydraulic, or pneumatic nature that could endanger and entrant. Isolation is accomplished by precautionary measures that include blocking off, disconnection, and lockout/tagout. Gates, conveyors, and other fill and reclaim equipment fall into this category. DON’T authorize entry until the atmosphere of a bin, silo, or tank has been assessed or tested for oxygen and any other known toxics or combustible gases. DON’T enter into a space for rescue without obtaining assistance first and having an attendant at the opening. Government statistics show that 60% of rescuers who do not take the time to get another attendant become fatalities themselves. DON’T issue permits without physically checking the space to be entered. DON’T allow permit times to extend beyond one work shift. DO inform control room personnel of the intent to enter the bin, silo, or tank. DO lower the required equipment such as tools, lights, etc. 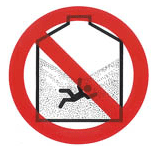 on a separate rope prior to the entrant when entering from the top of a bin, tank, or silo. DO tie off whenever possible to the structure when working around the drawoff or on top of the grain mass.